Sustainable, giving, durable, thoughtful… Calaisio rattan wares go above and beyond the ordinary, to deliver unique servingware pieces created with good intentions, and which are naturally elegant and extraordinarily durable. 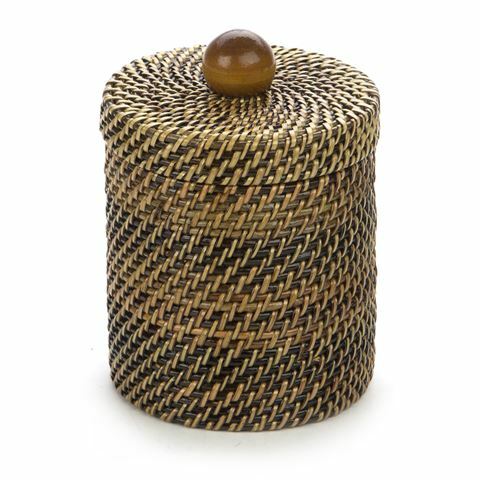 Hand-woven in the Philippines from “vignes d’ea” or water-vine, which is sustainably sourced from mountainous rainforests, each Calaisio piece is signed by the weaver who created it, along with the time taken to create the intricate weave. This lends a wonderful, personal air to Calaisio’s tableware range, which is finished with a subtle lacquer and results in a durable and elegant product. Hand-woven in the Philippines by local artisans. Woven from water-vine, which is finer than most other rattans and is expertly woven for surprising strength. Water-vine is sustainably sourced and fast-growing, for minimal impact on the environment. Heat resistant, with a lacquered finish. Features a lid with a wooden handle. Each Calaisio piece includes a statement of authenticity signed by the artist and noting the time it took to weave your piece. The sale of Calaisio pieces also directly benefits these artists and their communities. Dimensions: 11cm (w) x 14cm (h).